GRAPH 1 The main teaching of this graph.......is the striking correspondence in average rise and fall of the death-rates of small-pox, of zymotics, and of all diseases together. 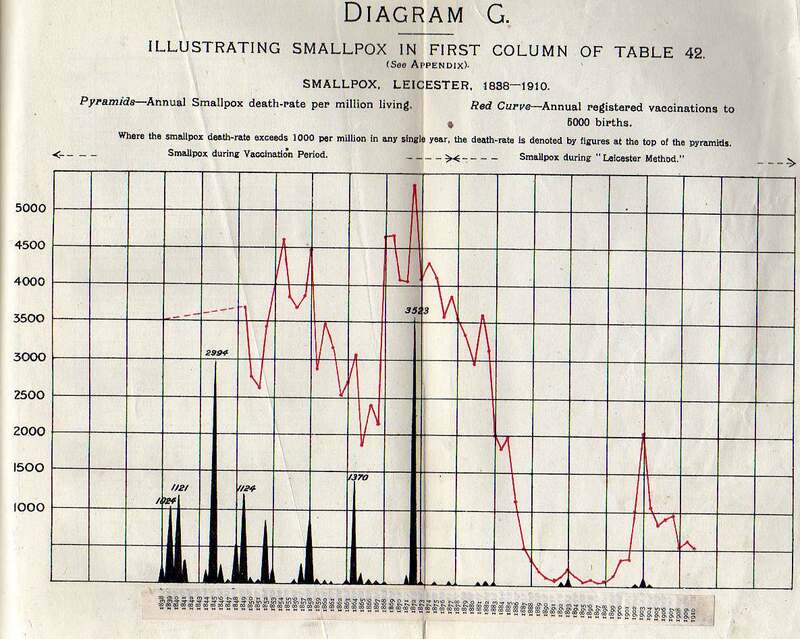 This correspondence is maintained throughout the whole of the first part, as well as through the whole of the second part, of the graph; and it proves that small-pox obeys, and always has obeyed, the same law of subservience to general sanitary conditions as the other great groups of allied diseases and the general mortality. Looking at this most instructive graph, we see at once the absurdity of the claim that the diminution of small-pox in the first quarter of our century was due to the partial and imperfect vaccination of that period. Equally absurd is the allegation that its stationary character from 1842 to 1872, culminating in a huge epidemic, was due to the vaccination then prevailing, though much larger than ever before, not being quite universalan allegation completely disproved by the fact that the other zymotics as a whole, as well as the general mortality, exhibited strikingly similar decreases followed by equally marked periods of average uniformity or slight increase, to be again followed by a marked decrease. There is here no indication whatever of vaccination having produced the slightest effect on small-pox mortality. GRAPH 2 The second graph shows that, even taking the Commissions favourite method of comparing the zymotics separately with small-pox, all of them except measles show a similar or a greater decrease during the period of official registration, and also agree in the periods of slight increase, again proving the action of the same general causes (which I have pointed out at p. 37), and leaving no room whatever for the supposed effects of vaccination. 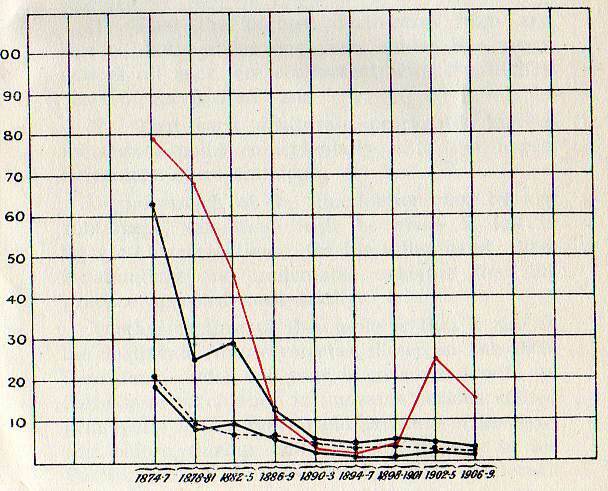 GRAPH 3 Graph 3. shows that similar phenomena occurred in England and Wales as a whole, the other zymotics and the total deaths obeying the same laws of increase and decrease as small-pox. Comparison with graph 1. shows the much greater severity of small-pox epidemics in London, illustrating the fact, which all the statistical evidence of all countries strikingly enforces, that small-pox mortality is, other things being equal, a function of density of population, while it pays no regard whatever to vaccination. 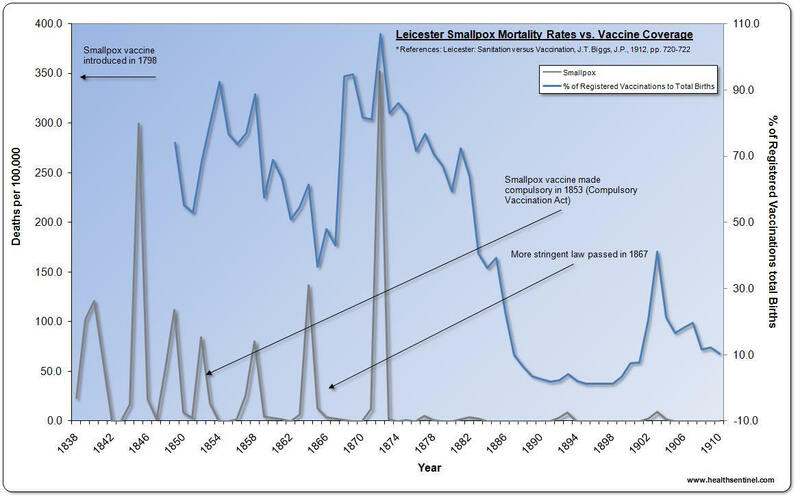 This is further shown by the short, thick dotted line which exhibits the total number of vaccinations since 1872, when private as well as public vaccinations were first officially recorded, and which proves that the continuous decrease of vaccination since 1882 has been accompanied by a decided decrease, instead of an increase, in small-pox mortality. 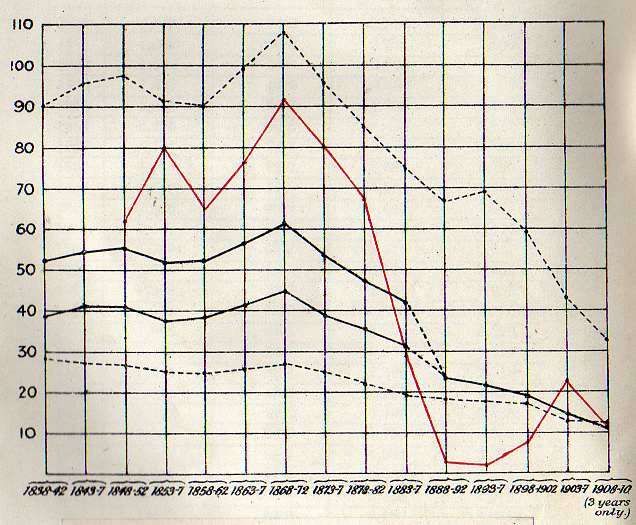 GRAPH 4 Graph 4. shows the statistics of mortality in Ireland and Scotland from small-pox and certain chosen zymotics, from the tables which were laid before the Commission by the official advocates of vaccination. These show two striking facts, which the Commissioners failed to notice in their Final Report. First, the smaller amount of small-pox mortality in Ireland than in Scotland, the latter being alleged to be well vaccinated, the former imperfectly so; and, secondly, the similar difference in the two chosen diseases and the general parallelism of the two. Here again we see clearly the influence of density of population, Scotland having a very much larger proportion of its inhabitants living in large manufacturing towns. GRAPH 5 The next three Graphs, 5., 6., and 7., show small-pox mortality in Sweden, Prussia, and Bavaria countries which at previous enquiries were adduced as striking examples of the value of vaccination. They all show phenomena of the same character as our own country, but far worse as regards epidemics in the capitals; that of Stockholm, in 1874, causing a death-rate more than 50 per cent. higher than during the worst epidemic of the last century in London! The graph of small-pox and zymotics in Bavaria is given merely because the statistics were brought before the Commission as a proof of the beneficial results of vaccination in well vaccinated communities. It was alleged by Dr. Hopkirk that almost the whole of the population were vaccinated, and admitted by him that of the 30,742 cases of smallpox in 1871 no less than 95.7 per cent. were vaccinated! The epidemic was, however, less severe than in Prussia, again showing the influence of density of population less than one seventh of the Bavarians inhabiting towns of over 20,000, while one-fourth inhabit similar towns in Prussia; but we see that during the latter half of the period chosen small-pox greatly increased, and the other zymotics remained very high, indicating general insanitary conditions. And this case was specially brought before the Commission as a proof of the benefits of vaccination! In their Final Report the Commissioners omit to point out that it really indicates the very reverse. GRAPH 9 This Graph shows various Death-Rates in Leicester, in five-year Averages. GRAPH 11 Army and Navy. 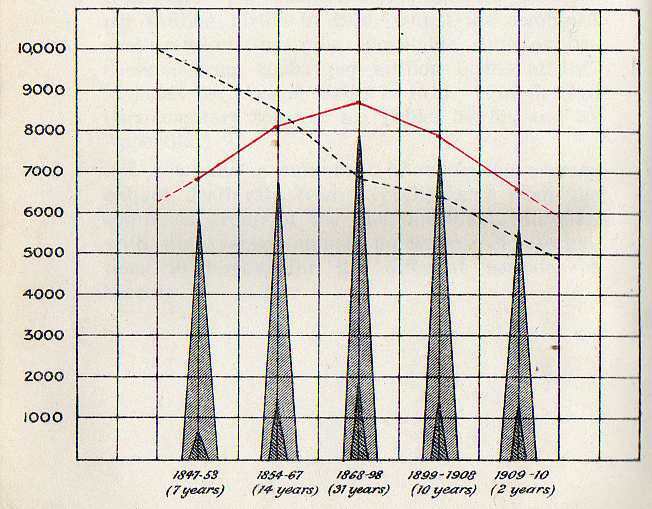 GRAPH 12 Smallpox Mortality per 100,000. The Army and Navy as compared with Ireland. Graphs from Biggs book LEICESTER: SANITATION versus VACCINATION BY J.T. BIGGS J.P. IN GROUPS OF FOUR YEARS. 1874—1909. See the drop of death-rate from Erysipelas with the drop in smallpox vaccination. 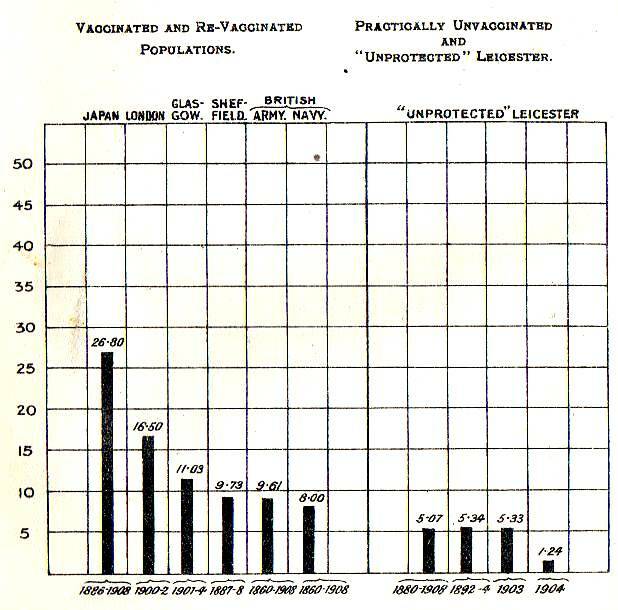 SMALLPOX FATALITY RATES, percent, of cases, in vaccinated and re-vaccinated populations compared with "unprotected" Leicester, in varying periods from 1860 to 1908. INOCULABLE DISEASES. ENGLAND AND WALES. 1847-1910. The Small Dark Pyramids show the actual death-rate from syphilis per million births. The Large Pyramids show the death-rate from nine inoculable diseases, including syphilis, per million births. The Black Dotted Curve shows the death-rate from all other causes per million births. The Red Curve shows the percentage of vaccinations to births. BOROUGH OF LEICESTER, for each of the years 1838-1910, the number of deaths from each of the seven principal zymotic diseases per million living, with, for each of the years 1849-1910, the percentage of registered vaccinations to births. GRAPH J ILLUSTRATING TABLE 49. LEICESTER. DEATH-RATES UNDER 6, 10, AND 16 YEARS. AND AT ALL AGES. After 1883-7, ages under 10 and 15 are merged into age under 20, as shown by dotted lines connecting solid curves. The lesson of this table (49) is that when we pinned our faith to the prophylactic and saving virtues of vaccination�from 1868 to 1872�no fewer than an annual average of 239 out of every 1,000 infants born died within twelve months of their birth. Now, having seen the error of our ways, and discarded the nostrum, instead of 239 deaths, there is only an annual average of 128 deaths per 1,000 births, or a decrease of 111 per thousand, being a saving of 46 per cent. These figures represent an annual saving of over 600 infant lives each year in Leicester. In other words, instead of 1,315 infants dying within twelve months of their birth each year, as in 1868-12, there are now only 702 such deaths. Even these are too many, but, fortunately, the trend is still in the right direction. The saving of children's lives under five years of age is on the same lines of progress. Whereas in the high vaccination period of 1866-72 there were 107 deaths per thousand living at that age, now there are only 34 per thousand, being a decrease of 73 per thousand, or a saving of 68 per cent. This represents a saving of over 2,200 lives each year of children living under five. In other words, if the death-rate under this heading had continued as in 1868-72, no less than 3,109 children under five years of age would have died within each year, instead of only 890. These remarkable results show us where the saving of life has been effected by our sanitary work, minus vaccination. The preservation of life under 15 is equally remarkable, but as this age is now merged in that of twenty years, which is practically an adult age, it is unnecessary to deal with it in this chapter. I, therefore, relegate it to that on the general death-rate of Leicester.